With two acres of vintage farm equipment and vehicles dating from the 1900’s all the way to the 2000’s, you’re sure to find something that takes you back to your childhood and keeps you talking about the good ol’ days for hours. Branson Auto and Farm Museum originally opened in May 2009 under the name Branson Auto Musuem as a museum dedicated to the appreciation and preservation of historic automobiles. In 2010, it was purchased by Mr. Maurice Wilder of Clearwater, Florida, a successful real estate and farm businessman. After he fell in love with a car at the museum and purchased it. Later, he purchased the entire museum! Ever since, there has been no looking back. The museum was completely rebuilt into a 90,000 square foot building, with one half dedicated to classic & antique automotive history and the other half to farming implements and equipment history. 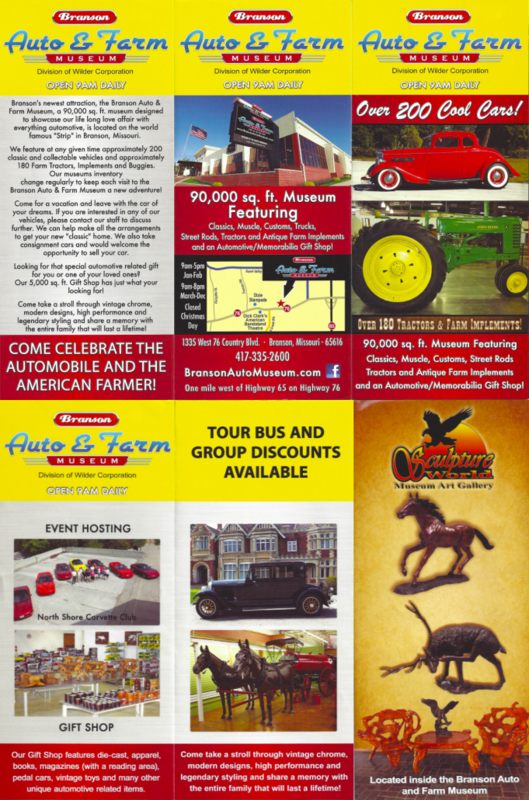 Therefore the name was changed to The Branson Auto & Farm Museum. Mr. Wilder grew up in the Midwest farming community which led to his very successful lifelong career in farming and ranching, among many other business ventures. Most of the vehicles are for sale and we are always looking for interesting cars and tractors to add to the collection. We hope you enjoy viewing our collection! We have the goal of always acquiring interesting vehicles and farm machinery for the public to enjoy.